Motivated by a desire to help find Malaysia Airlines flight MH370, which is believed to have crashed into the southern Indian Ocean in March 2014, we proposed a way of working out where objects hit the surface of the ocean using underwater acoustic waves. Unfortunately this didn't lead to finding the plane. However, our research into these waves has moved on since we first proposed the idea in 2017, and we have now been able to identify two locations where the aeroplane could have impacted with the ocean, as well as an alternative route that the plane may have taken. When you drop a pebble in a lake, water waves are generated from the location of the impact, while sound waves create the splashing noise you hear. Another type of wave is generated inside the water too: hydroacoustic. Similar to a sound wave, hydroacoustic waves move relatively slowly through the dense water, at 1,500 metres per second (m/s). In our last study we looked at acoustic-gravity waves picked up by hydrophone (underwater microphone) stations in the Indian Ocean, to narrow down where flight MH370 may have impacted the ocean to two points. But now we have found another factor that may prove crucial for pinning down the location of the impact: sea floor elasticity (flexibility). When acoustic-gravity waves start travelling through the the sea floor their propagation speed boosts to over 3,500 m/s, from the 1,500m/s they would have been travelling at through the water. Previous analysis considered the sea floor to be rigid, which would not allow the radiating waves to move through it. However, if the elasticity of the sea floor is taken into account then the waves will travel at this enhanced speed. The acoustic-gravity waves that we analysed for both this and our previous study came from two hydroacoustic stations (each of which has three underwater microphones called hydrophones), which were active at the time when MH370 went missing, on March 7-8, 2014. The first, HA01, is off Cape Leeuwin, Western Australia, while the second, known as HA08s, is at Diego Garcia, which is part of the Chagos Archipelago. 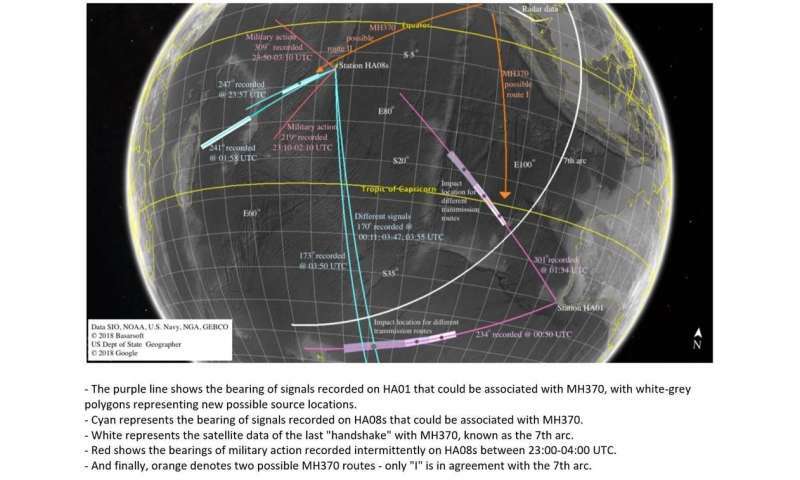 Previous studies have mostly looked at the signals collected by station HA01 between 00:00-02:00 UTC on March 8 2014, as well as signals that related to the last satellite data transmission from MH370 at 00:19 UTC (known as the 7th arc. However, with our new understanding of acoustic-gravity waves we decided to look at hydroacoustic data from HA01 that was recorded during a wider timeframe – between 23:00 and 04:00 (+1 UTC) on March 7 and 8 – and analysed data from the further away HA08s station too. Allowing for the effects of sea floor elasticity, the signal locations that we had previously identified using data from HA01 were now different. If the signal travels, say, at twice the speed for a given distance, it should have gone twice the originally calculated distance (without elasticity), so the impact location would be further away relative to the hydrophone station. This is shown on Figure 1 above as signal marks on the purple bearings (the direction of the signals relative to the hydrophones). Looking at HA08s, the signals were more challenging to analyse. They were distorted by noise which is believed to have been caused by a military exercise in that side of the ocean (depicted as red lines on the map above). However, although the proposed route and point of impact is distant from the 7th arc, we still recommend further studying a number of signals from HA08s. The bearings of some of these signals fall within the area where signals from the military action were picked up, so it is possible that the signals are associated with the military action. But if the signals are related to MH370, this would suggest a new possible impact location in the northern part of the Indian Ocean (as depicted in the top left of the map above). The locations of signals found using HA08s data do come with high uncertainty but still require further detailed and careful analysis. Unfortunately, on top of the noisy recorded signals, 25 minutes of data from HA08s is missing. The signals we have analysed indicate that the there was a 25-minute shutdown that has gone unexplained by the Comprehensive Nuclear-Test-Ban Treaty Organisation, which is responsible for the hydrophone stations. In light of this research, we recommended that signals recorded at all times between 23:00 (March 7) and 04:00 (March 8) UTC, at both stations HA01 and HA08s are analysed with no exception. And that this is done independently from other sources (such as satellite data), to minimise inclusion of uncertainties related to them. 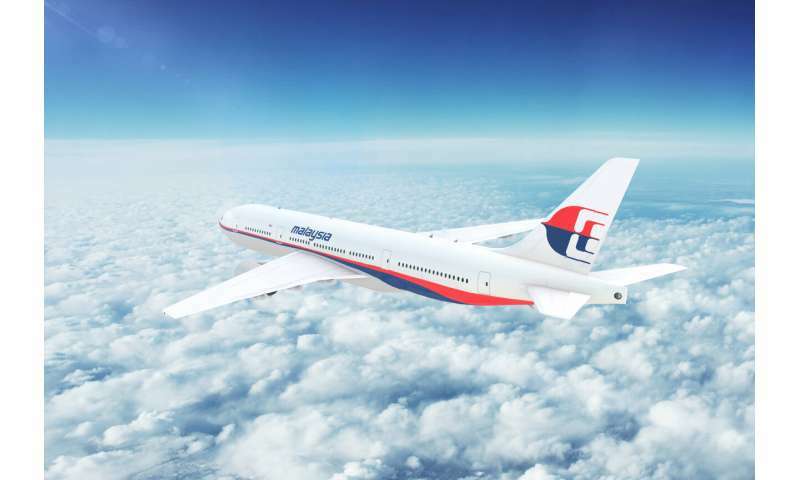 These recommendations have been communicated to the MH370 Safety Investigation Team in Malaysia, the Australian Transport Safety Bureau, and other relevant authorities with the hope that the search will be resumed to find the missing aircraft.